Nine planets with their moons orbit the central star of our Solar System, the sun. The orbits of the planets are located in virtually the same plane with minimum inclination. Mercury is the planet nearest to the sun. Then follows Venus, the Earth, Mars, Jupiter, Saturn, Uranus, Neptune and Pluto. The planet of Mercury, Venus and Mars are very similar to the earth and are referred to as the inner planets. They have a relatively small mass, a thin atmosphere, or none at all, and feature a rocky surface.The planets located beyond the asteroid belt,Jupiter, Saturn, Uranus and Neptune are much larger and called the outer planets. They have no solid surface and feature extensive atmospheres. The outermost planet is Pluto. Its orbit cycle is the longest of all. 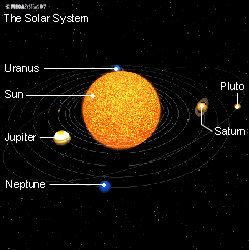 Pluto’s orbit is also slightly inclined towards the orbits of the other planets. Its structure is very similar to the inner planets (lack of atmosphere, solid surface) and Pluto is therefore considered an earth-like planet as it is also rather small, its dimensions not exceeding the size of the larger moons of Jupiter and Saturn. How has such a system of one star at the center and several planets it developed in space? It is believed that particles in the interstellar clouds of gas and dust condensed and formed a star. The increased pressure in this newly formed star induced nuclear fusion reactions resulting in the radiation of light. The gravitational field of the star held the gas and dust cloud in orbit, similar to the rings of Saturn. The more dense parts of this cloud attract more and more matter, increasing in density and eventually, due to gravitation, forming the compact sphere of a planet. Smaller conglomerates of mass that were not fully swallowed by the developing planets, ended up as moons or satellites orbiting these planets.